Dublin, 1922, and Sean O’Keefe has been demobbed from the Royal Irish Constabulary and has become one of the great mass of unemployed, sitting on the sidelines of the civil war raging between former comrades, the pro-treaty Free Staters and the anti-treaty Irregulars. He spends his days drinking to forget his time in the Great War and subsequent fight for independence until he agrees to help pay off the debt his father owes to Ginny Dolan, a madam of a Monto brothel. She wants O’Keefe to use his policing skills to find her missing son, Nicky, an idealistic teenager who acts as a runner for the Irregulars. To aid him, she partners O’Keefe with Albert, her strong-arm protection, who has a tendency to hit first and ask questions later. Given Nicky Dolan’s links to the Irregulars, they are not the only ones seeking the boy and his leader Felim O’Hanley. The newly formed CID and intelligence service, staffed by battle-hardened men who will kill to maintain the fledgling new state, are hunting him down after one of their own was killed when a sting operation went wrong. Thus ensues a game of cat and mouse as O’Keefe and Albert traipse round Dublin’s seedy underbelly seeking Dolan’s hiding place whilst avoiding the attentions of the police. Irregulars is the second Sean O’Keefe story, set a couple of years after Peeler, during the Irish civil war. Like Peeler, the story is multi-layered and nuanced, capturing the convoluted national politics and family allegiances of the time. And by demobbing O’Keefe and having him search for a politically-motivated and adventure-seeking teenager, the plot allows McCarthy to portray the vast social differences between the well-to-do and the slums, as well take a relative impartial path through the politics and skirmishes between pro- and anti-treaty forces. In so doing, he creates a very strong sense of place and time. Indeed, the contextual history is very much front stage in the telling, with McCarthy demonstrating and imparting a detailed knowledge of Dublin and the civil war in the early 1920s. This does work to slow the story a little, and at times veers the book towards a history lesson rather than crime tale, but it is generally fascinating stuff. Where the telling does falter, however, is in the inclusion of a number of passages which are superfluous or overly long and little progress the story and the narrative would have benefitted from them being omitted or tightened. This is countered by the generally strong characterisation, especially Sean O’Keefe, Nora Flynn, the agent employed to track him, and Just Albert, the brothel strong-arm, and some really wonderful dialogue. 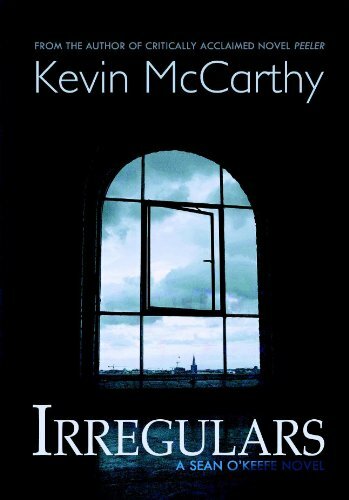 Overall, Irregulars is a very good read, with a strong sense of place and history, excellent prose and dialogue, and an engaging, page-turning plot.